Join us as we celebrate our 4th Annual Grateful Pets featuring Dead Reckoning. 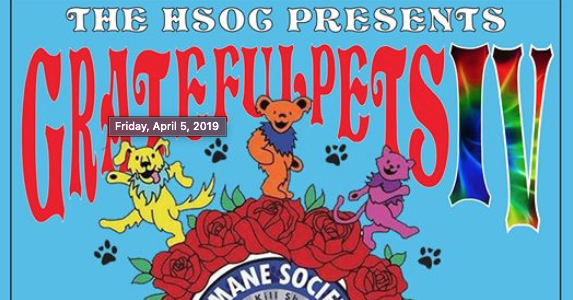 Our friends from Dead Reckoning are coming out again to help the Dogs and Cats here at our Shelter……..They will be putting on an amazing show to help you shake them bones and hopefully raise a few for the HSOC. Food(Super yummy array of Josie Kelly favs), music(Dead Reckoning), FUN(??? ), games(famous grateful pet wheel o prizes) and others, drinks(cash bar and signature GPIV beverages). plus many other lovely surprises……..
stay “tuned.”… for more deTAILS coming soon.